Cracks in stained glass are fairly common, especially on older glass that has gracefully stood the test of time. In fact, you have probably seen chips, cracks, and even broken glass here and there on the stained glass in your Springfield church when you inspect it from time to time. 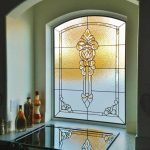 As it were, minor repairs, like replacing a few pieces of broken glass here and there, can be performed while the glass is in place in its frame; for major repairs to stained glass windows, the entire window absolutely must be removed and the stained glass repaired in a professional studio. However, small repairs are just fine as the window stands and are called drop-in work. 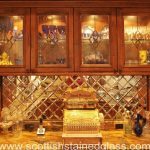 We do both types of restoration expertly but drop-in stained glass repairs are something we, at Scottish Stained Glass, do quite frequently. It is a process that entails cutting the came flange around the broken piece of glass at the solder joints then folding it back to repair or replace the old glass. We try to keep the original glass in the window whenever possible–but if necessary we are quite skilled at creating matching pieces in our studios. Epoxy Edge-Gluing: This technique results in a virtually invisible line and is, for this reason, often used on painted glass. Epoxy is tinted to match the glass and it can also be infused into shattered glass or microscopic cracks. Epoxy produces a very strong repair but deteriorates in sunlight–so it usually requires secondary glazing to protect it from UV degradation. Silicone Edge-Gluing: This repair method has the lowest strength and should be used when a flexible joint is needed. Silicone repairs are easily removed, so they are really good for a quick fix but will do nothing for the long-term strength of your glass. Additionally, they are unattractive and really useless long for the preservation of valuable church stained glass. 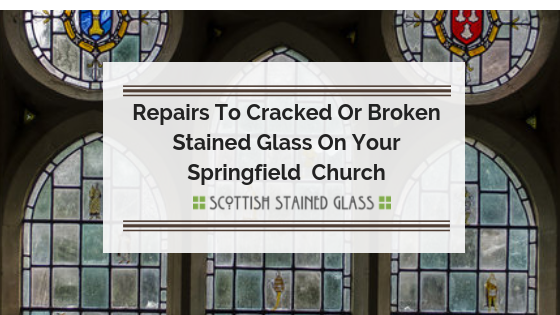 Although Scottish Stained Glass is based out of Kansas City, we have done many church stained glass repairs and restorations in Springfield and all over Kansas so, please, contact us today for more information and pricing on repairing and restoring the stained glass in your Springfield church! Cracks in stained glass are fairly common and something you will start to see as glass ages. The good news is–your glass has withstood the test of time thus far. 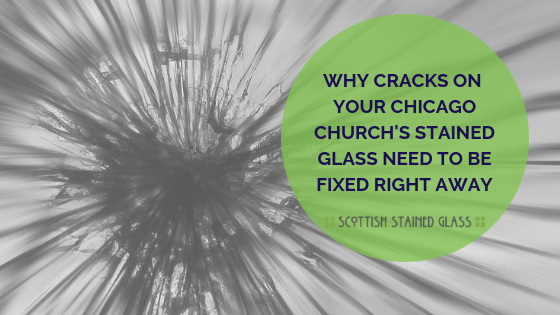 Crack and broken glass can be a big deal if you look at your Chicago church’s stained glass and see chips, cracks, and even broken glass– you are not alone and it could be a simple fix. Minor repairs, like replacing a few pieces of broken glass here are fairly easy to repair in the frame but major repairs are not. 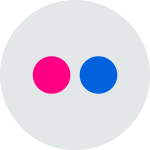 How do you tell which is which? By having a professional, like Scottish, inspect your church’s stained glass. 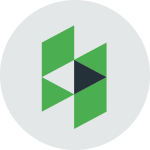 We can tell you if we need to do small repairs called drop-in work which entails cutting the came flange around the broken piece of glass at the solder joints then folding it back to repair or replace the old glass or if a larger restoration is needed. Regardless we try to keep the original glass in the window whenever possible–but if necessary we are quite skilled at creating matching pieces in our studios. 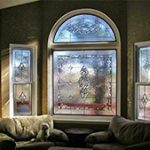 For very badly cracked stained glass–replacement is really your only choice. In these cases, your Chicago church’s stained glass windows are best restored by removing them and replacing the glass piece by piece. However, at other times, small cracks can be fixed without replacing the glass as it stands. It all depends on where the affected glass is located and the breadth of the cracks. It is important to note: cracks in stained glass will enlarge over time (as the edges grind against one another) which is why it is important to have cracks looked at and repaired as soon as you see them. Epoxy Edge-Gluing: This technique has an end result of almost invisible line and is, for this reason, often used on painted glass. The reason why is because epoxy can be tinted to match the glass. This is also a great method for shattered glass or microscopic cracks. Epoxy produces a very strong repair but deteriorates in sunlight–so it usually requires secondary glazing to protect it from UV degradation. Silicone Edge-Gluing: This repair method has the lowest strength and is a quick fix used when a flexible joint is needed. However, it will do nothing for the long-term strength of your glass. Luckily it is easily removed because it is unattractive and essentially useless long for the preservation of valuable church stained glass. 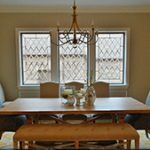 Although Scottish Stained Glass is a company out of Colorado, we have affiliate companies in the Chicago area to do church stained glass repairs and restorations here in Chicago and all over the Mid-West. Contact us today for more information and pricing on repairing and restoring the stained glass in your Chicago church! 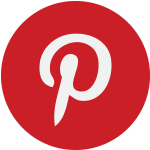 Whether you Grand Junction Church already has stained glass that you are looking to restore or is thinking about adding stained glass to its chapel, you likely know little about the subject as of yet and what types of stained glass options are available for you since, stained glass for churches is a topic not many ordinary people know a lot about. 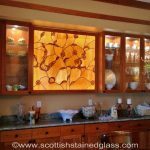 However, here at Scottish Stained Glass, it is our business to know all about our lovely artform and we would love to share some of our ideas and options available to you. 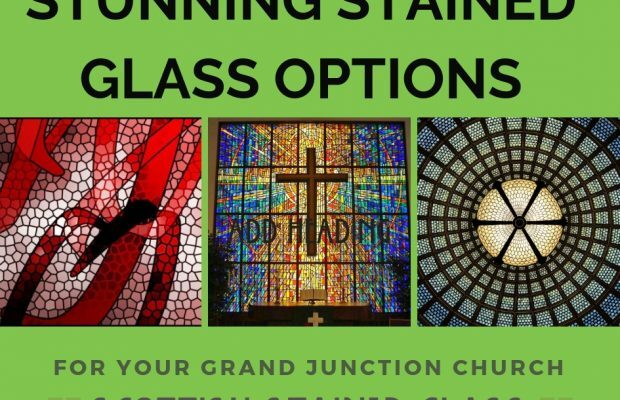 Below we have listed some of the popular and pleasing stained glass examples to grace your Grand Junction church and please parishioners for years to come. Opalescent glass is a piece of glass that in which anywhere from two to five colors are mixed together giving the glass depth and you a variety of color combinations. It contains a white opaqueness so that the glass is not see through it and it perfect for cathedrals and entryways. This type of stained glass is transparent and usually is singularly colored. As the name denotes this glass is often used in cathedral windows but is wonderful for pictorial scenes, symbols, and memorial plates too! Hand-stained glass is like the name implies stained/painted by hand. It is typically reddish-brown or black. However, it is incredibly beautiful and lifelike because after an artist applies a layer of stain to a piece, they then carefully tap or brush in highlights–giving the piece great depth. This glass works wonderfully with pictorial scenes depicting natural symbols or humans because of the amazing detail one is able to achieve. 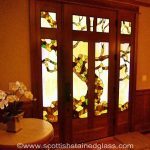 Different from leaded glass, faceted glass has its own unique aesthetic. This is because it is a thick glass where the surface is faceted or chipped. Faceted glass is held together with epoxy which allows the spaces between the glass to vary if desired–allowing light to dance and play on the surface and giving it a very distinct look. 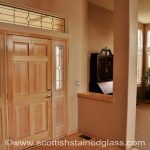 All of these types of glass treatments are ones we use at Scottish Stained Glass, not only to create new church windows but in restoring windows to their former glory. 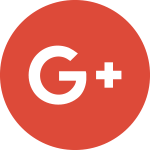 Reach out to us today for information and pricing on stained glass creation, installation or restoration on your Grand Junction church. Stained glass windows in churches here in Taos are not only gorgeous but a significant piece of US history as well. Here in Taos, we some amazing stained glass on the churches and at Scottish Stained Glass we are happy to be a part of preserving it. Although it is true that having your stained glass repaired and replaced by a professional is something that every church should be prepared to do and begin saving funds right now, there are definitely some minor maintenance duties congregations can do to prolong the life of their Taos church’s stained glass not to mention help keep it keep its luster too. Most church stained glass repairs should be done by a vetted professional with a lot of experience. However, you should always be well-acquainted with your Taos church’s stained glass so you are aware of any changes. Also, there are a couple things your church maintenance person can do to keep your glass looking lovely for your parishioners to enjoy. 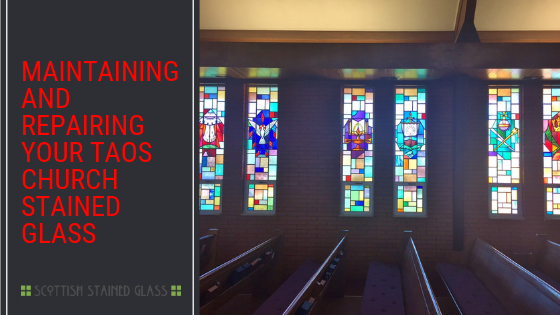 Light Cleaning Of Your Stained Glass: Although weekly cleaning of your Taos church stained glass is not necessary, when it does become dirty or dusty you should carefully clean the glass with distilled water and a soft cloth. *If the glass is painted, make sure to find out whether or not the glass has been fired or you could damage the finish. Maintain wood frames around the Stained Glass: The wood frames on your Taos church’s stained glass windows play a huge part in its stability and durability. For this reason, moisture sealant and/or paint should be used on the wood portions to ensure the frame stays intact. These sealants should be applied according to their individual directions, but be sure to let your maintenance person know to avoid getting these finishes on the glass since they could affect the clarity and luster of the stained glass and potentially remove paint on unfired pieces. Replace missing or loose putty as needed: This is an aesthetic repair done to keep your stained glass looking good but not in lieu of structural repairs. Should you notice cracking or flaking putty on the outer edges of the window, you can quickly replace the putty and paint over it. However, this is just a light fix, if you see larger cracks or missing chunks as it could indicate that there is greater structural damage and a professional should be called. Keep in mind that the care above is for competent church groundskeepers or handymen. 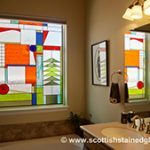 The best idea is always to call in a trained professional like Scottish Stained Glass if you don’t feel completely confident. Of course, no major repairs or replacements should ever be done by anyone besides a stained glass professional. 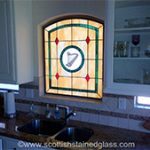 Contact us at Scottish Stained Glass for more details on maintenance or for restoration pricing. 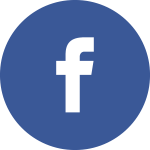 We serve many of New Mexico’s major areas including Taos and would love to work with you! Stained glass in churches is not only beautiful but represent the beautiful church history in the United States as well. Here in Springfield, we are lucky to have a good amount of gorgeous stained glass on the churches in the area and the preservation of this glass is something we are proud to be a part of. 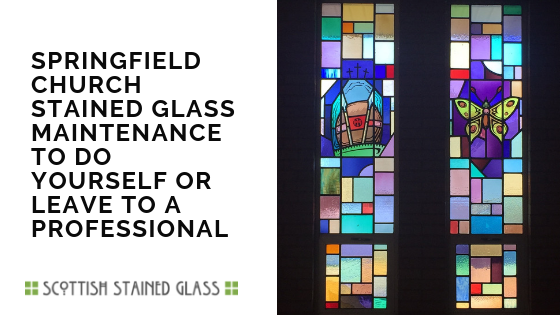 While having your stained glass repaired and replaced when needed is something that every church should be prepared to do and begin saving funds for, there are things that congregation members can do themselves to extend the life of their Springfield church’s stained glass. The small things below will not only extend the life of your stained glass but also keep it looking lovely and vibrant too! Most church stained glass repairs should be done by a well-vetted stained glass professional. However, there are a handful of things you or your church groundskeeper can do to maintain your glass and keep it looking its best for your parishioners to enjoy. 1.Light Cleaning Of Your Stained Glass: Although you Springfield church stained glass does not need to be routinely cleaned like a regular window, if the stained glass becomes dirty or dusty you can carefully clean the glass with distilled water and a soft cloth. 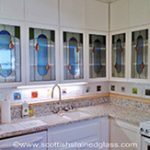 *If the glass is painted, be sure to verify that the stained glass window has been fired or you could damage the finish. 2. Maintain wood frames around the Stained Glass: The wood frames on your Springfield church’s stained glass windows are an incredibly important element that stabilizes the whole piece. Moisture sealant and paint should be used to ensure the long life of the entire piece. 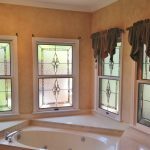 These sealants should be applied according to their directions, however, great care should be used to avoid getting these materials on the glass, where they can affect the look of the glass and potentially remove paint on unfired panels. 3 Replace missing or loose putty when needed: This is purely aesthetic repair for when you notice cracking or flaking putty on the outer edges of the window. While you can quickly replace the putty and paint over it to keep your church stained glass looking good, a professional should be called for larger cracks or missing chunks as it could be a sign of deeper structural damage. Keep in mind that all of the ideas above are for competent church groundskeepers. If you would like your Springfield church maintenance person to do some of these light maintenance duties, it is essential to call in a trained professional like Scottish Stained Glass, to come in and consult with your church handyman to give instruction on light maintenance duties and materials. No major repairs or replacements should ever be done by anyone besides a stained glass expert. As always, we suggest a yearly check-up by a professional, especially on older stained glass. Contact us at Scottish for more details about which maintenance your church can do itself and which ones we can do for you. We serve all of the Kansas City area including Springfield, Missouri.